With their aged magnets set in the original stagger pattern,'54 Specials look like the earliest vintage pickups on your guitar. Inside they utilize glass-fiber bobbins that are especially machined for each position on the guitar and assembled using the larger early style hand-ground magnets. Each neck, middle and bridge pickup is wound differently to maximize the tone and output for that particular position and for the in-between positions. 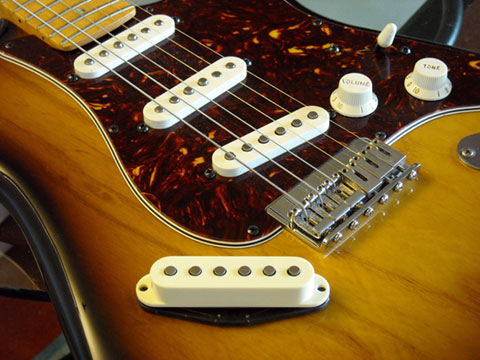 The bridge pickup is made with a larger bobbin, for a hotter, darker tone and better balance. Because the '54 Specials capture and enhance the tonal qualities of the early style pickups, the overall output, tone and balance are actually improved, even when compared to expensive vintage guitars. 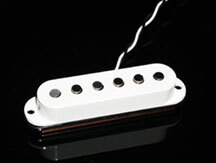 These are the original Harmonic Design Vintage Plus Pickups. A healthy combination of vintage P-90 thinking in a Strat package, with staggered nickle-steel pole pieces, non-microphonic glass-fiber bobbins, and our exclusive gold-screen shielding for low noise. These pickups defy the myth that high-output equals muffled, flubby tone. The special-design magnets on each pickup form a continuous magnetic field from the bridge to the neck of the guitar, for a smooth, equal output from all three pickups. Vintage Plus Pickups have a rich, thick bass response and high output, but still retain the classic Strat tonal character. Their special design magnets eliminate string-pull and increase the natural sustain of the strings. These are the smoothest, best balanced pickups available, literally thousands of them have been used on high-end custom guitars all over the world since 1984. "I tried these out while teaching a clinic in L.A. After I played them one time, I had them installed in every guitar I own." Strats have needed this pickup since 1954. A drop-in bridge pickup that can instantly deliver the rich, fat output of a Les Paul Jr. But the real advantage is in the tone. 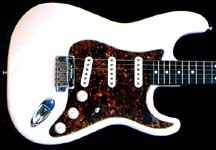 The Super 90 tonal character is fully compatable with Strat neck and middle pickups, and is specifically designed to sound great through the same amp you already use for vintage Strat pickups. Now you can instantly switch to a dramatic new solo sound while playing live, without changing your amp settings. "Sounds way better than a humbucker in the bridge position...and with no routing." All pickup sets are reverse-wound, reverse-polarity for hum canceling at no extra charge. Well they have, notably eccentric slide master Lowell George. But to put a Tele pickup in a Strat requires some serious gouging out of the body underneath the pickguard. We worked out that a standard sized Tele pickup could be machined to fit into a Strat without any modifications to the guitar, and the first STP pickup was born. 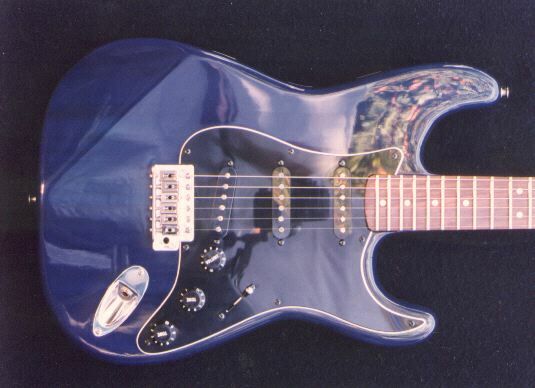 Years later, we re-worked the design further to fit the original STP sound into a Strat pickup cover to match the look of the neck and middle pickups. More importantly, we retained the original sound of the STP. So these ain't just another Strat pickup with a plate stuck on the bottom. 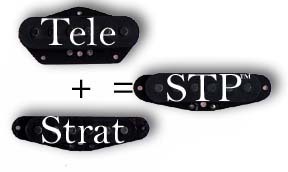 It's the original STP tone with every bit of the sound of a Telecaster and our '54 Tele pickup that you can get. Rich, full, '54 Special Tele sound-with full output and a twangy, snarling bite that makes a Strat really jump up and squawk like it just fell off a Barnyard Truck. 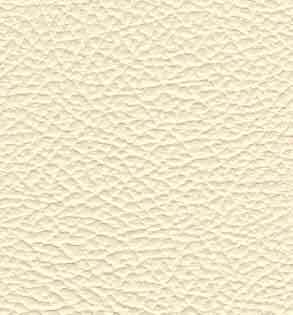 STP's now come with a black, white, aged white, mint, parchment or cream cover included.